You’re trying to do some reading when you hear it: a video playing somewhere off-screen. You curse under your breath, scroll down to find the offending media, then try to find back your place in the article. It doesn’t have to be like this, and Safari 11—one of the new features in High Sierra that’s also available to Sierra and El Capitan users—solves the problem. 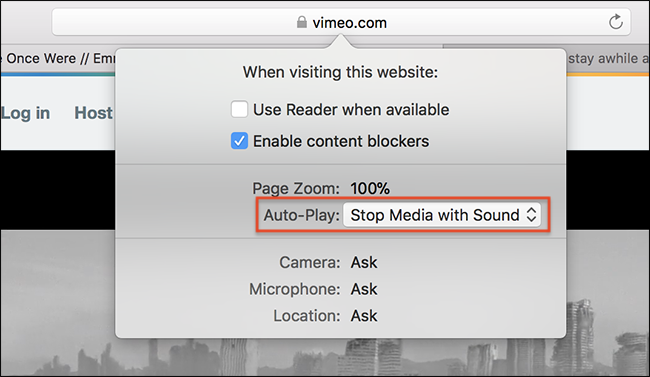 Safari, which Mac users should be using instead of Chrome anyway, now blocks almost all auto-playing videos with sound by default. You can go a step further and block all auto-playing media on any particular domain. But what if actually want certain sites to auto-play? Well, by default, YouTube and Facebook do autoplay, so don’t worry about those sites. But Vimeo, another prominent video site, does not. To allow auto-playing on other sites, you need to head to that site,then click click Safari > Settings for This Website in the menu bar. This will bring up a window that allows you to toggle site-specific preferences, including autoplaying videos. Click the dropdown next to “Auto-play” and you’ll have three choices: Allow All Auto-Play, Stop Media with Sound, and Never Auto-Play. Select the option you want for this particular site, and you’re done. Note that you can review all of your configured sites in Safari’s preferences, which you’ll find by clicking Safari > Preferences in the menu bar. Head to the Websites section, then click Auto-Play in the sidebar. From here, you can change the settings for any site.